The Best Street Photography blogs from thousands of top Street Photography blogs in our index using search and social metrics. Data will be refreshed once a week. Also check out Top Street Photography Youtube Channels list for Top videos on Street Photography. 2.11 StreetShootr | Street Photography News, Reviews & Inspiration. 2.48 Michal Fanta | Street, Documentary & Editorial Photographer. 2.52 John Lewell Photography | Street Photography Thoughts, Tips & Analysis. Street Photography newsletter is a comprehensive summary of the day's most important blog posts and news articles from the best Street Photography websites on the web, and delivered to your email inbox each morning. To subscribe, simply provide us with your email address. Crete, Greece About Blog We are the StreetHunters and we are Street Photographers. We enjoy taking photo walks and documenting every day situations with our cameras. We are all from different parts of the world and have different experiences. Here you will find Street Photography tips, techniques, videos, workshops, courses & tutorials. Learn night street photography, hip shots, flash street photography & more. Facebook fans 8,557. Twitter followers 3,373. Facebook fans 317,992. Twitter followers 176,777. About Blog Welcome to this community of friendship, learning, and passion for photography. Eric Kim is an international street photography teacher. Facebook fans 93,277. Twitter followers 29,537. Portland, OR About Blog Street Photography tips & guides, interaction & community, travel & photography, & much more! Where Travel & Street meet. Brought to you by f.d. walker, the traveling street photographer, and amazing photographers from all over the world. Facebook fans 6,052. Twitter followers 200. Facebook fans 3,699. Twitter followers 865. Facebook fans 577,947. Twitter followers 1,731. Berlin, Germany About Blog Street Bounty is your resource for Street Photography and contemporary Documentary Photography. Facebook fans 2,012. Twitter followers 6,492. London About Blog Welcome to the Street Photography Lounge. This is where you can upload your street photography images, share your latest work and ask for critique. You can also start discussions, ask questions and generally discuss anything relating to street photography. Facebook fans 710. Twitter followers 611. Blackpool, England About Blog David is an internationally acclaimed photographer and author. His soulful seascapes and powerful street portraits have earned him a worldwide following. His blog is all about Photography & Postproduction Training for Photographers. Facebook fans 1,308. Twitter followers 9,800. Facebook fans 4,922. Twitter followers 7,852. 11. StreetShootr | Street Photography News, Reviews & Inspiration. Toronto, Canada About Blog News, reviews and inspiration for street photographers. StreetShootr is dedicated to candid street photography and to those who practice the elusive art! Facebook fans 2,431. Twitter followers 1,279. About Blog The best community, dedicated to street photography. The best contemporary artists, on a single page. Facebook fans 21,247. Twitter followers n/a. Japan About Blog A photographer in Tokyo specialized in Street, Urban and Night Photography. I photograph in multiple genres, street photography, urban landscape, urbex, and others. Though my work is varied, it is aimed at one goal: a personal portrait of a great city. About Blog Vivo is a word that connotes life in several languages and observing life is what this collective does. As practicing street photographers, the members capture fleeting moments, interpreting life around them and challenging our perceptions of the world. The collective also aims to bring an appreciation of street photography to a wide audience. Facebook fans 230,996. Twitter followers 2,031. Palazzolo sull'Oglio, Lombardia About Blog I'm an italian photographer who love to travel, food, good wine and cats too. Photographing the differences that make us human. Facebook fans 5,766. Twitter followers 45. About Blog Hi ya, Olivier Duong, PHD here. We created this site and magazine as a platform for photographers, to inspire and be inspired by the works of the community. Facebook fans 6,980. Twitter followers 1,872. Denmark About Blog Jonas Dyhr Rask is an official Fujifilm X-Photographer and a member of the KAGE collective. Follow this blog where he shares his experience as a photographer and reviews of Fujifilm X-T100. Facebook fans 734. Twitter followers 2,667. Facebook fans 107,906. Twitter followers 8,348. Seoul About Blog A Street photography blog. Find information on Street photography. About Blog StreetPhotograpy.com is a platofrm to uncover standards, to educate, to inspire, and to encourage our peers to strive for the very, very best. Indeed, that is our mission – to showcase the very best in street photography. Facebook fans 924. Twitter followers 1,077. New York City About Blog New York Daily Photography and History Blog. The blog consist of New York Portrait, Fine Art, and Studio Photographer, Street and Architecture Photographer, and tour and workshop guide. About Blog The Street photography in the world group offers itself as a reference point and meeting place for those who wish to get in touch with street photography in the world and want to share their passion. Sicilia About Blog I'm not a professional photographer ... I do not live with photography ... I do not like being called a photographer and I do not think I'll ever be ... I'm just an amateur with a camera who likes to capture the interesting side of those simple and normal things usually neglected in life Every day. Facebook fans 1,147. Twitter followers 69. Paris About Blog I am a passionate photographer who runs a daily photo blog with writings on street photography technique and gear. The blog also provides insights and additional information on our trip around the world. Facebook fans 7,838. Twitter followers 1,936. Berlin germany About Blog Martin’s work is about the human element in urban space. He explores the underlying emotions in the city between existential angst, boredom and joy. Martin is a keen observer of the fragility and transiency in urban life. In his street photography Martin emphasizes the contrast between the soft fluid human shape and the hard and static fabric of city infrastructure. Facebook fans 1,075. Twitter followers 1,540. Facebook fans 12,388. Twitter followers 3,139. Berlin, Germany About Blog Street Photography from Berlin and beyond. Workshops in Berlin and worldwide. Source for aspiring Street Photographers. Street Photography Guides for many cities like Los Angeles, San Francisco, Barcelona, Istanbul or Manchester. Made to inspire you and shift your Photography to the next level. Enjoy! Facebook fans 24,792. Twitter followers 5,214. About Blog Our aim is not only to promote street photography in general and to realize and showcase collective projects, but also to offer other photographers the possibility to contribute to public projects. Facebook fans 4,242. Twitter followers n/a. Nürnberg, Bayern About Blog My blog is all about street and travel photography and the aim of this blog is a project to bring some structure and focus into my photographic journey. Facebook fans 17. Twitter followers 73. Medellín, Colombia About Blog Michael Kowalczyk Photography is a blog by Michael Kowalczyk that features articles about street and travel photography. USA & France About Blog My blog is all about chasing light and telling stories. The blog is all about street photography. Facebook fans 16,156. Twitter followers n/a. About Blog My name is Ryan, and I have been a street photographer and documentary filmmaker since 2012. Mirror shot is a street photography blog. Sharing my tips on getting started in street photography, advice on camera equipment and film recommendations. Facebook fans 4. Twitter followers 31. Staufen, Schweiz About Blog The Photoblog of Severin Koller with latest street photographs and information on street photography. Facebook fans 2,980. Twitter followers 48. Glasgow, UK About Blog I capture moments of wonder and interesting people, going about their living adding value to their life or their business. Facebook fans 561. Twitter followers 1,352. London About Blog Hello, I am Dan and welcome to my site. I am a London based photographer who likes to capture moments, the essence of people and life. Facebook fans 827. Twitter followers 492. Spain About Blog Street and Urban Life photographer portfolio of collections, series and projects including a photography blog and contact sections. About Blog Street & Urban Photography is what I love. It comes with endless opportunities to interact with our fellow human beings and to create images of never to be repeated events and moments. This site will develop as hopefully, will my photography. Los Angeles, CA About Blog A showcase for street photographs made in Los Angeles, by natives and those passing through. Facebook fans 374. Twitter followers 17. Brisbane Australia. About Blog I have been Photographing for over 30yrs now, but I’ve only been shooting Street seriously since December 2014. I love the stories and surreal elements Street Photography brings with it. It allows me to see dreamscapes in crowded urban streets and paint with my camera. Baia Mare About Blog A Street Photography Blog. Lion City About Blog An avid street photographer based in Singapore who also likes to make night photographs. Find information on Night & Nocturne Photography, feature night photographers, black and white photography. Dorset, United Kingdom About Blog Paul Rusell is UK Street & Documentary Photographer where all the photos taken here are candid. South Tipperary, Ireland. About Blog Wojciech Ryzinski is a documentary and street photographer based in Tipperary, Ireland. 48. Michal Fanta | Street, Documentary & Editorial Photographer. About Blog A blog by Gene Lowinger with information on street photography and also many street photographs. Brooklyn, NY About Blog Tracy Barbour is a New York City Street Photographer, Documentary Photojournalist, and Portrait Artist. Tracy's work explores the grief and grace found in everyday life, from the streets of the world around her to connecting one on one with those who have stories of hope and despair. Facebook fans 106. Twitter followers 233. 52. John Lewell Photography | Street Photography Thoughts, Tips & Analysis. Colchester, UK About Blog Hi, I’m John Lewell and I’m addicted to street photography. There is a loosely knit confederacy of street photographers, many of whom observe a code of behavior befitting a profession, but interaction between us is usually restricted to getting out of the way when we bump into each other on the street. If you’re now making a start with street photography You’ll find useful tips and examples here. About Blog A Madrid Street Photographer Blog. Facebook fans 69. Twitter followers 87. About Blog Mick Yates is a passionate photographer all his life and his blog includes candid portraiture, events, documentary, travel and street stories. Facebook fans n/a. Twitter followers 4,400. About Blog John Hughes and I've been photographing since I was 12 years old (now in my 40's) and I have a real love for it. In the 1980's I started learning photography and I quickly found a real love for this. But it wasn't until my photography teacher, A Mr Littlewood introduced me to book called Subway by the American photographer Bruce Davidson. Facebook fans 478. Twitter followers n/a. About Blog Please feel free to explore my blog or photo projects. We're in this together. Keep clicking, Chris. Berlin, Deutschland About Blog The blogI discovered street photography as an exiting and versatile genre of art. From that point on I’ve seen scenes of daily life literally in another light. I try to capture and turn them into little pieces of art. Facebook fans 1. Twitter followers 356. London About Blog Every person has their own unique way of storytelling – photography is mine. Its comes to me naturally like leaves to trees. I have always been an avid observer of human behaviour and now, my camera is enabling me share what I observe with you. Facebook fans 1,855. Twitter followers 279. Hudson Square About Blog I am a street photographer in downtown Manhattan. The purpose of this blog is to present street photos soon after I take them. About Blog Dublin is the rare bird of fashion photography. It combines the old and the New in a salubrious chocolate box of melted greys and browns with flashy greens and blues. It is a cacophony of style, combining the trendy non belted Chanels with the leather overcoat of hipster modern. About - Linda Wisdom is a London Street Photographer and social documentary artist. Her black and white images capture candid moments of urban city and street life. Get up to date news and information on her events and projects. About - Mr Gareth Iwan Jones Is A Young (Ish) British Photographer Specialising In Editorial And Commercial Portraiture. Gareth's Vibrant And Playful Style Has Brought Him Regular Commissions With Numerous Prominent Publications And Brands. Currently Calling Bristol Home, He Splits His Time Between The 'Mild West And London With Commissions Taking Him Across The UK And Abroad. About - The city of Oxford, people and other places as seen through my lens. My passion for film photography and life in Oxford is reflected in my photo blog. The city of Oxford, people and other places as seen through my lens. My passion for film photography and life in Oxford is reflected in my photo blog. 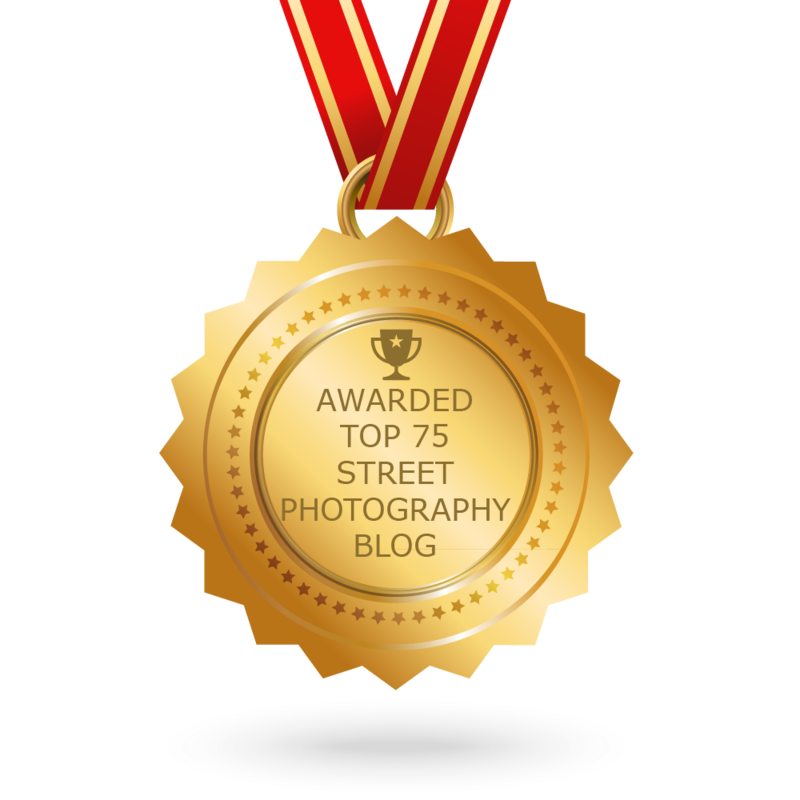 CONGRATULATIONS to every blogger that has made this Top Street Photography Blogs list! This is the most comprehensive list of best Street Photography blogs on the internet and I’m honoured to have you as part of this! I personally give you a high-five and want to thank you for your contribution to this world.